Large chequer plate platform, W x D: 380 x 610mm. Slip-resistant serrated treads, 89mm depth. Handrails and wheels available as factory fitted options. The perfect choice for a tradesman is a sturdy and durable platform, which allows you to work to your full ability and assists you with those hard-to-reach areas. Our heavy duty aluminium platform steps can do this and offers you more flexibility than ladders. 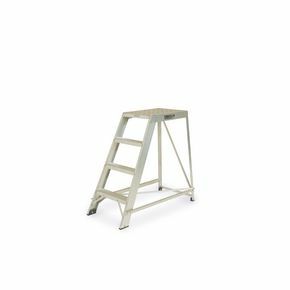 Available with steps on one side of the platform or with steps on both sides giving the user two access points - they are also available in a choice of seven heights; 475, 710, 945, 1180, 1415, 1645 or 1880mm. They have a larger chequer plate platform for extra grip with 89mm deep slip-resistant serrated treads, so you can be confident that the users and any equipment will be safe whilst using our product - they have 150kg capacity so you can be confident they are robust. For added security for the user there is an option of having factory fitted handrails to the platform on either the left or right hand side; you can add this accessory once this product is in your basket. Our heavy duty aluminium platform steps come with a 12 month guarantee and have FREE UK Delivery. To suit heavy duty aluminium platform steps.